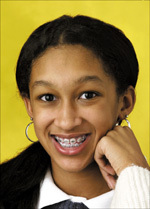 Information about orthodontic treatment for teenagers? Most patients begin orthodontic treatment between ages 9 and 16, but this varies depending on each individual. Because teenagers are still growing, the teen years are often the optimal time to correct orthodontic problems and achieve excellent results. Most orthodontic problems are inherited. Examples of these genetic problems are crowding, too much space between teeth, protruding upper teeth, extra or missing teeth and some jaw growth problems. Other malocclusions (crooked teeth) are acquired. In other words, they develop over time. They can be caused by thumb-sucking or finger-sucking as a child, mouth breathing, dental disease, abnormal swallowing, poor dental hygiene, the early or late loss of baby (primary) teeth, accidents, poor nutrition or some medical problems. Sometimes an inherited malocclusion is complicated by an acquired problem. But whatever the cause, the orthodontist is usually able to treat most conditions successfully. Treatment is important because crooked or crowded teeth are hard to clean, and that may contribute to tooth decay, gum disease, and tooth loss. A bad bite can also cause abnormal wear of tooth surfaces, difficulty in chewing and/or speaking, excess stress on supporting bone and gum tissue, and possible jaw joint problems. Without treatment, problems may become worse. Orthodontic treatment to correct a problem may prove less costly than the additional dental care required to treat the problems that can develop in later years. Then there’s the emotional side of an unattractive smile. When you are not confident in the way you look, your self-esteem suffers. Teen-agers whose malocclusions are left untreated may go through life feeling self-conscious, hiding their smiles with tight lips or a protective hand.